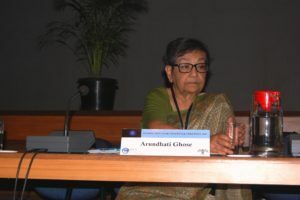 The last time I spoke with Ambassador Arundhati Ghose was in April 2016. A team from the ISSSP at the National Institute of Advanced Studies (NIAS) including Prof. Rajaram Nagappa and Prof. S. Chandrashekar were to visit New Delhi to discuss few projects with the government and think tanks in Delhi. Amb. Ghose, being a part of the NIAS, we approached her to be a part of the ISSSP delegation. She responded with a short note informing about her cancer. After reaching Delhi I called her to enquire about her health without realizing that it would be my last correspondence with an Institution. An Institution – she was. Those who worked with her in the MEA and other senior scholars who interacted with her in the various seminar circuits would vouch for it. And more importantly, for those young scholars, who had the opportunity to know her, listen to her and interact with her. I was one of those fortunate ones. While she was known for her “Not Now, Not Ever” crisp remark about India not signing the CTBT and her strong diplomatic projection of India’s interests, she was also a great human being, scholar and a mentor. I met her first, when I was a part of the Institute of Peace and Conflict Studies (IPCS); I had the privilege of working closely with her. She took part in the seminars and conferences that I organised on nuclear issues, was a regular part of the workshops especially for young scholars, and also the track-II dialogues we held. She was thorough and very methodical in her approach. She would always come prepared for her lectures, with a detailed and elaborate written note. In advance, she would check how much time she would have for her presentation – and ensure that she sticks to the time allotted – whether 8-10 minutes as a part of a panel, or a full length lecture in 20-30 minutes. She would be precise and ensure she covers her ground. If only she had picked up a teaching assignment after her retirement, she would have become a great teacher and mentor to many young scholars. However, she compensated for it by taking time to be with them, whenever we organised workshops for young scholars. She was a regular faculty for those 3-5 days nuclear workshops we organised; she ensured that she spent enough time with the young scholars. One could see the students and scholars surrounding her during tea and lunch/dinner. Her lunch and dinner tables will always be crowded with the young scholars during those workshops and the only thing that would distract her would be her urge to smoke. Many of us wished and even spoke about her smoking. She would give us a pat on our shoulders, wink at us and pretend that the question was never put to her. Or, she would change the subject. Diplomat, wasn’t she? There were few occasions that we had to request her to be a discussant for the draft essays of young scholars, including an intern. She would always be willing and spend the same amount of time, which she would otherwise spend with the seniors. She would take every work seriously; who has authored it – junior or senior would not matter. A thorough professional. More than that, she was a great human being. Inside the conference/meeting halls, there would be a serious debate and disagreement, but she would never let those academic differences affect her personal relationships. Outside the conference table, she would be friendly and smiling, of course politely telling that she did not agree. She was also fond of her pets. She would not let me referring “them” to dogs or cats. It is always a “he” or a “she”, and would refer they by the name. She would even be willing to skip the lunch, if she has to take her pets to the veterinarian. We all will miss you. Ma’am.